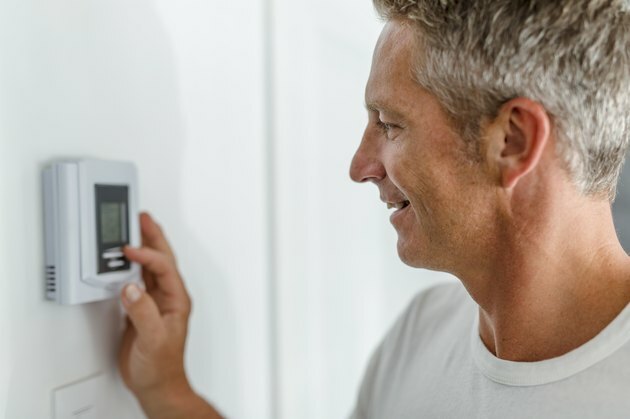 You may be replacing the thermostat that controls your furnace or room heater, or you may be installing a thermostat for the first time. Either way, if there are only two wires, your choices for a new thermostat are limited to mechanical or battery-powered models. If you're looking for a Honeywell two-wire thermostat, you can't do much better than the Honeywell T87 series. The Honeywell T87 is the standard round thermostat you find in many older homes, although some newer models have a backlit LED screen instead of the familiar graduated temperature scale. Models with an LED screen require batteries, but the original mechanical models don't. You could actually use any Honeywell thermostat that gets its power from batteries, but you might be paying for functionality that you won't use. The extra expense isn't excessive, though. The Honeywell RTH111 series includes models that cost about $20, and while they are designed to control heating, cooling and heat pumps all at the same time, one of these can definitely function as a two-wire thermostat. If you see only two wires sticking out of the wall at the thermostat location, it means that the thermostat has only one function, which is to switch a single appliance off and on. The appliance is usually a furnace, but it could be a room heater or even an air conditioner. The simple circuit formed by the two wires passes through the thermostat, which has the same effect on the appliance as a wall switch has on lights. When the temperature sensor inside the thermostat opens the switch, electricity stops flowing and the appliance shuts down. That's it. There are no compressors, reversing valves or second-stage heating functions about which to worry. When you remove the backplate of a Honeywell thermostat, you'll find the connection terminals, and the number of terminals depends on the sophistication of the model. Whether there are two, five or more, however, they all bear generic labeling that is the same on any thermostat. The two terminals you'll always find – and the ones you need – are the R and W terminals. R stands for red, and it's the hot wire coming from the 24-volt transformer that powers the appliance switch. W stands for white, and it's the return wire to the transformer. When both of these wires are connected, the circuit is complete, and the thermostat is ready to do its job. The two wires coming out of your wall should be red and white, but they may not be, and if not, you may have to check the control panel on the appliance to determine which wire is which. The control panel has the same terminal designations as the thermostat. Just note the colors of the wires on the R and W terminals and connect those wires to the R and W terminals of the thermostat. If you're controlling an appliance without terminal designations, such as a furnace, consult the furnace wiring diagram to identify the terminals. You're unlikely to get a life-threatening shock when handling 24-volt wires, but it's safer to get no shock at all. Turn off the breaker controlling the furnace or air conditioner before wiring the thermostat. When connecting wires to the terminal screws, trim off excess wire that could contact other terminals. If the wires touch and make a short circuit, the thermostat won't work. If your furnace or air conditioner runs all the time, the wire connections are the first thing to check.